I’m trying to pack in as much protein as I can in a muffin that my kids (10 and 13) will actually eat. What do you think about putting peanut or almond butter in these? I’m not worried about fat as my shorties are quite slim but I AM concerned about sugar because it just seems so evil. I have one kid who has to take medication that suppresses appetite so I want to load that one up with yummy filling and healthy food in the am before meds kick in. I’m not a great baker so I don’t know if I could just slip some PB in here or if I should use PB in place of something else because of consistency/texure and baking time. Would love your expert opinion if you have a minute for that. Meanwhile, just adding that you are a wonderful writer and so funny, which I really appreciate and which makes it really fun to read your blog. Thank you so much for this! I’m a new fan and will be checking out your other recipes. Alexandra–glad you’re enjoying it here! lovely to have you! as to the muffins–go with your gut 😉 peanut butter is lovely in baked goods, and would make these more like banana-split-brownie sundae muffins! 😉 You can adjust the sugar to your liking, replace it with honey or maple syrup or coconut sugar. Enjoy! These look delicious! Do you have the nutritional breakdown per muffin? Curious of protein and sugar content. Just to be clear before I make these. Did you use eight whole eggs or eight egg whites? My kids and I love this recipe for chocolate muffins. We have made it several times and I am so thankful that I came across it. I would like to know if you have a similar recipe or have ever changed this recipe to make an apple sauce and cinnamon flavored muffin? I can follow a recipe but when it comes to altering one, I am sure to make a mess of it. Thanks! Heather–absolutely! Replace the banana with applesauce, equal amounts, and skip the cocoa powder. Add 1 Tablespoon of cinnamon and you have applesauce muffins! We also do pumpkin and pumpkin pie spice–yum! Any ideas on a replacement for cocoa? Toddler hasn’t eaten much chocolate. Was thinking cinnamon or peanut butter maybe. Sure! cinnamon is awesome–have totally done that with good results–use 1 tablespoon. I try to avoid dairy, can I use coconut oil instead of the yogurt? And we’re not gluten free so would this work with the same amount of spelt flour? Jessica, I am not experienced with spelt flour or dairy replacements–although I don’t think coconut oil would be the best thing to use for yogurt–maybe applesauce? This will require some experimenting, but I’m sure you will come up with a tasty solution! My son doesn’t like bananas. Is there anything I can sub the banana with? Trying so hard to find ways to sneak protein in him. sure! try applesauce, but use less as it’s usually wetter than bananas. I have a son who doesn’t like bananas, but he doesn’t mind them in these muffins because the chocolate overwhelms them. if you mash them real fine (I’ll put mine in the blender with the eggs!) and he may not even notice them! I like to sub in pumpkin instead of bananas, it works great! Could I use honey in place of sugar in your high protein muffin recipe? is it 4 cups of the oats before you grind into flour? or is it 4 cups of flour after it’s already been made? I think maybe you should amend the recipe ingredients to reflect the 4 cups AFTER grinding as currently it implies before grinding and having done it both ways, it’s quite a difference. Deborah! Thanks for the feedback! Super helpful! What is the best way to thaw them? Do you individually wrap them to freeze? Thanks! Plain Greek yogurt or plain regular yogurt? These are moist and delicious! Instead of using cocoa powder, I used 2 scoops of protein powder and I topped my batter with oats. And I used 1/4 cup of honey instead of sugar. Just pulled my batch out of the oven and couldn’t resist trying one right away! They smell amazing, they taste amazing… Such a great recipe! I did use buckwheat flour instead of ground oats because the kids are already asleep and I didn’t want to wake them up. Turned out amazing! Thanks for sharing, Trina – they’ll be perfect on our early-morning road trip tomorrow. Has anyone tried these with Greek yogurt instead of regular yogurt? Didn’t know if that would make a difference or not! Just made these! Totally delicious and turned out perfect. I handed the recipie just to try it so 2 cups ground oats plus at the end I mixed in an extra heaping 1/2 cut of unground oats. Baked for 22 minutes. Totally perfect and not too sweet. Thanks! These are great! I halved the recipe because I was short on bananas and I still got 18 full size muffins out of it! My kids had them for after school snack: just enough to take the edge off until dinner and more filling than a granola bar etc. Do you know if the egg yolk would be used as a binding agent in these? I know that yolks can play a lot of roles in baking so I wanted to get your input on if I used egg whites instead of whole eggs what the outcome would be. (just trying to cut down on some of the fat)…excited to make these nonetheless! the recipe I based this off of only used egg whites, so you’re probably ok to leave out the yolks, Kylie! Hi! I made these today and followed the recipe exactly (using applesauce instead of yogurt) and they did not turn out anything like your picture! 🙁 I’m wondering what i did wrong? The only thing I can think of is that I measured 4 cups of whole oats, THEN ground into flour with my food processor… maybe it ended up less than 4 cups after I ground them? OR maybe I didnt grind it powdery enough? I would say it was a “course flour” when I was done with it. They didnt raise very much at all and had a very eggy consistency. I did notice the batter was super runny- it seemed way too runny to me. Any suggestions would help please! Thank you! Elissa, it does sound like your oats were not ‘flour’ yet, nor did you have enough of them after grinding. Any time I get muffin batter that seems to runny, I go ahead and add more of whatever flour I’m using. I hope you have better results next time you try it! My 4 bananas came out to be 386g to be accurate, I used nonfat vanilla greek yogurt and 1/2c. Truvia baking blend. Calories 114, Total Fat 3, (sat fat .8, poly fat .7, mono fat 1.1) Cholesterol 62.4, Sodium 237.7, Potassium 130.8, Carbs 19.7, Fiber 2.6, Sugar 3.6 and Protein 5.2. I hope this helps those who wanted the info. I use Sparkpeople recipe calculator to get all of my recipe nutrition info. I’m also going to add some hemp protein to these. I can’t wait to try them! Kristen, you’re awesome! Thanks so much! Has anyone tried adding a scoop of protein powder to these for an extra boost? Any thoughts on how that might effect the baking process? That’s a great idea, Trish! I don’t believe a single scoop would negatively effect the finished product. Dang, I wish I read this first!!! I have my Young Living protein powder and just made these muffins. They are in the oven right now! If they turn out as fabulous as I hope, I’ll make them again and I’ll add a scoop!!! I didn’t have the vanilla so used 1 tbsp of maple syrup instead. I also used 1/2 cup of coconut sugar instead of 1 cup of sugar. I calculated these muffins to be over 8g of sugar in each which I think is pretty high for a muffin. I used 1 cup of hazelnut meal + 3 cups of oats (ground) and the protein comes out to less than 5g each. I was expecting these muffins to be lower in sugar and higher in protein. They are very tasty but a bit too sweet for me. I’ll try again with less sugar and add some nuts. 5 grams is relatively high for a muffin! I’m glad you experimented and made these your own. Great recipe! Thanks for sharing. Anyone have calories per? These tasted so wonderful despite crazy morning sickness taste buds! I was really tired of all the usual high-protein snacks, so your timing in posting this couldn’t have been more perfect. Thank you! These look absolutely delicious but, FYI, they would only be gluten free if gluten-free oats grown under a purity protocol are used. Otherwise, oats contain gluten via cross contact with gluten grains in the field, on shared farm equipment, and via processing in a shared facility. “Regular” oats, therefore, contain very high amounts of gluten and are not safe for those who eat gluten free for medical reasons. Certified gluten-free oats grown under a purity protocol on the other hand are grown from pure pedigreed seed; the fields used to grow gluten-free oats are required to follow specified crop rotation protocol, surrounded by an isolation strip, and inspected several times during growing season to remove any errant gluten-full grains; all machinery and equipment is either thoroughly cleaned or dedicated; oats are processed in a dedicated gluten-free facility; and oats are tested to ensure their gluten-free status of less than 20 ppm gluten using R5 ELISA Methodology. That level of “scrutiny” is required to ensure that oats are safe for gf folks. I just wanted to mention that since your recipe is labeled gluten free. There isn’t any oil/butter in the recipe? Do you have the nutritional value of these muffins somewhere? I don’t see it posted unless I’m missing it. Thanks, these look great! I don’t yet, but another commenter posted her calculations in a comment–hope that helps! If I have oat flour, should I put less than 4 cups? Thanks! Can’t wait to try these ? I could just HUG you!!! I was just agonizing over trying to find some recipes to put in my breakfast rorotation for our new fall schedule. My children really need the protein, but they may mutiny if they see one more scrambled egg. They are going to be so happy tomorrow!! Your recipe says sugar or stevia based sweetener. Can I just get away with half the amount of sugar (some recipes that’s ok) or do I need the full amount? I’ve never tried stevia based sweeteners, but I would love to reduce our sugar consumption if you have suggestions! Oh, Cindy! I’m so glad I’ve helped inspire your mornings! You can totally experiment with the sugar–but 1 cup is pretty minimal for the amount of muffins this batch makes. If you want to try stevia, you can check at your local grocery store–I found some stevia to experiment with at my Wal-mart. It’s usually sweeter, oz for oz than sugar, thus the 1/2 cup suggested if you’re using stevia. Have a great morning tomorrow! yeah! so glad to hear you’re making the recipe your own and loving it! Nice to see you had time for a post! It’s been awhile. 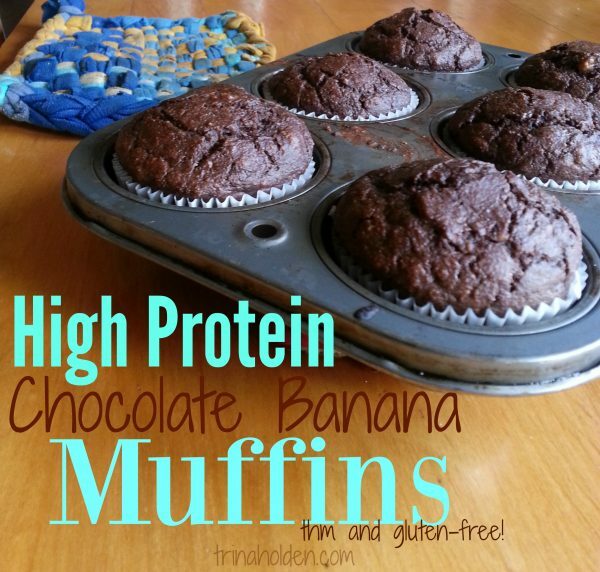 Too funny – I just made a double batch of these muffins this morning. I LOVE the THM recipes. And I’m drinking the “Singing Canary” right now. God bless! Love this idea!!!! Avoiding Dairy for one kid…what would you suggest in place of yogurt??? I love seeing you in my inbox. I smiled and prayed peace over your home. Jennifer–Applesauce is a great replacement for the yogurt–I do that if I’m running low on dairy 😉 You are too sweet–It’s good to be back and always appreciate your prayers! Is there a substitute for the oat flour? We are grain free so could coconut or almond flour work? If so, would the quantity be the same? My kids would LOVE these . . .
Chanelle, almond or coconut is going to be a little denser than the oat flour and give it a different consistency (as I’m sure you’re aware) but from my experimenting with grain free baking, I’ve learned that if the recipe has enough other stuff (and this one does, with the banana and eggs and all) then you can probably get away with it! I say give it a try, and let me know how it goes? Thank you for posting these. We have tried them and they are great! I love that they can be made with ingredients easy to find. Can you post more THM recipes with ingredients found at Walmart? Yay! glad you liked them, Lindsey! I hope to posting more of the new dishes we have added to our menu, and yes, mostly Wal-mart and Aldi ingredients because that is where I mostly shop!